These vertical lines between the eyebrows can make us look a little fretful, as well as pulling our eyebrows down to a less flattering position. So how do you get rid of frown lines between the eyebrows? One of the simplest treatments for these lines are anti wrinkle injections commonly known as “Botox®”. This is one of the easiest and most effective areas to treat with anti wrinkle injections and there also tends to be a lifting and shaping effect of the eyebrow which can be modified by an experienced practitioner to give a more flattering brow line. Dramatic results (as above) can be seen in one treatment using “Botox®”/Anti wrinkle injections. 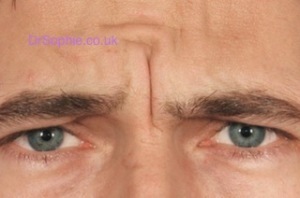 Other skincare options for treating these lines include “Dermal Fillers” however although these tend not to alter the shape of the eyebrow if you are having another area treated with “Filler” and there is a little left over (once the other is treated satisfactorily) Dr Sophie will suggest other areas which can be treated free of charge. Your initial consultation is free, and you will be seen by Dr Sophie personally. When you arrive we will fill out any confidential paperwork. We will carefully discuss your main concerns and possible treatment options, along with a exact quote of the total cost of the treatment. The benefits and disadvantages of each treatment will be discussed fully. There is no obligation to have a treatment, you may wish to go away and think about it or you may wish to time the treatment in order to fit in with other events in your life. If you wish to go ahead with a treatment it might be possible to go ahead the same day. Special notes for frown lines removal; One of the simplest ways to treat these is with Botox®/anti wrinkle injections, one of the great advantages of using Botox®/Anti wrinkle injections is that there is virtually nothing to see on leaving the clinic, you can just go back to your routine and no one need know your secret. Although you should avoid strenuous exercise for around 4 hours afterwards or a massage within 24 hours after treatment. Ring 0203 556 1753 for an appointment with Dr Sophie. We would love to discuss your skincare needs. Please fill out this form and we will get in touch with you shortly.